Chuck Berry appeared on "Tonight Show With Jay Leno"
On August 29th 2008 Chuck Berry performed a fine rendition of "Johnny B. Goode"
A video recording of yesterday's performance can be seen by clicking here. kicked off his European Tour on July 10th in Opatija, Croatia at a now reduced schedule of 11 gigs. his longtime agent he would not do the last 2 Spanish shows of the tour for unspecified reasons. legally for the money back. cancellation of European shows in July 2008.
of The Imus Ranch Record (New West Records) a 13-track album featuring eight Grammy(R) Award winning performers. who are afflicted with cancer or other serious blood diseases. Williams singing "Mama Don't Let Your Babies Grow Up To Be Cowboys" which was made famous by Waylon Jennings. a line about the Ranch. Little Richard, Delbert McClinton, Willie Nelson and Randy Travis all recorded standards. (well known A & R executive). Imus selected each song and matched it to a specific artist. Chuck Berry shows in Istanbul & Boleslawiec have been cancelled! from local promoters will follow shortly. remains "tentative" until further notice. JERRY LEE LEWIS TOUR INFORMATION 1988 UPDATED! finally succeded to talk to Chuck Berry yesterday. First of all Chuck Berry does not want to reimburse his longtime agent. than going through a court battle which can take up to three years. very unlikely to happen as this behaviour is no basis to work on. A statement and/or apology was at no point offered by Chuck Berry. and Little Richard visit www.chuckberry.de. 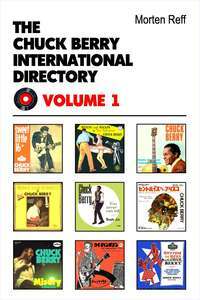 The Chuck Berry International Directory Volume 1 out now! This title is for the heavyweight Berry fan. It contains everything you ever wanted to know about Chuck Berry, in four enormous volumes compiled by the world-renowned Norwegian Berry collector and authority, Morten Reff. It is comprehensively annotated, with dozens of illustrations of rare record labels and sleeves, previously unpublished photos, etc. This volume contains: USA Discography; UK Discography; International Discographies (Argentina, Australia, Austria, Belgium, Brazil, Canada, Costa Rica, Denmark, East Germany, Finland, France, (West) Germany, Greece, Hungary, India, Israel, Indonesia, Italy, Jamaica, Japan, Mexico, Netherlands, New Zealand, Norway, Peru, Philippines, Poland, Portugal, Russia, Saudi Arabia, South Africa, South Korea, Spain, Sweden, Switzerland, Taiwan, Thailand, Turkey and Yugoslavia). ST. LOUIS — The Guitar King's old home may not be palatial, but it could soon be historic. considered by many the father of rock 'n' roll — on the National Register of Historic Places. awning against sturdy red brick and a narrow porch. foreclosure rates long after Berry sold it. "Maybellene," "Roll Over Beethoven," and "Johnny B. Goode." If nothing else, it would help cement Berry's place as one St. Louis' most famous residents. Berry bought the home shortly before the birth of his daughter, Darlin, he says in his autobiography. The family lived in the basement so they could rent the upstairs for extra income. "Oh, yeah," said Berry, wearing a captain's hat and bolo tie. "I remember it well." tree in front, planted after he left, looked pretty much the same, he said. He recalled how much he bought it for in 1950 — $4,500 — and the work he put in. "I had that awning put up," said Berry, which would explain the faded "B" on the exterior. other African-American entertainment pioneers — Redd Foxx, Tina Turner — also called home. Some on Whittier Street today still remember Berry's time there, but the details — Did he drive a Cadillac? Or a motorcycle? — have evaporated into neighborhood lore. practicing his signature country-meets-rock sound. the street at the time. On July 28, the city's Preservation Board unanimously backed the home's inclusion on the National Register. Final federal approval, though, could be tricky. does not typically recognize individuals who are living or still working. the fabric of American culture. In other words, that Berry is a living legend. each month in a venue — the Duck Room — named for his trademark gait. "Worldwide, he's probably better known than anybody else in St. Louis," Edwards said. Berry still calls the area home, splitting his time between Ladue and "Berry Park," his Wentzville retreat. that specializes in foreclosure properties. Now that he knows more, Gomm said he's open to selling it to someone who will appreciate its value. to have them have it." blues playing. One Kind Favor will be released on Geffen Records August 26th. album filled with the songs that influenced King in his early days as an artist. The World” (Walter Vinson and Lonnie Chatmon) and “Tomorrow Night” (Lonnie Johnson). channel “BB Kings Bluesville” (XM 74). For more than 60 years, Riley B. King - better known as B.B. King - has defined the blues for a worldwide audience.